Two South Korean electricity workers have been killed in Iraq in the latest ambush involving Asian nations planning to contribute troops to the coalition. 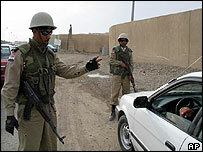 Two other Koreans were wounded in the attack on Sunday near the city of Tikrit, north of Baghdad. They are thought to have been working for an unspecified US firm and are the country's first casualties in Iraq. Two Japanese diplomats and their Iraqi driver were shot dead on Saturday, also near Tikrit, an anti-coalition centre. A South Korean foreign ministry official who spoke to Reuters news agency said the electricians had been returning from Tikrit to their hotel in Baghdad when they were ambushed. President Roh Moo-hyun has committed South Korea to sending a 3,000-strong contingent of troops to Iraq, building on the 675 South Korean medical and engineering troops already deployed since May in the south, around Nasiriya. However, he has yet to decide whether to include combat troops in the deployment and correspondents say Sunday's killings could have major political ramifications. Spain, which already has combat troops in Iraq, lost seven intelligence agents in an attack on Saturday - a day which also saw the killing of two US soldiers and a Colombian contractor. The two Japanese diplomats were shot along with their driver as they stopped to buy food. They have been named as Masamori Inoue, 30, who worked at the embassy in Baghdad and Katsuhiko Oku, 45, who worked at Japan's London embassy. They had been travelling to a conference on the reconstruction of northern Iraq in Tikrit. Japanese Prime Minister Junichiro Koizumi said he was "furious" but his country would continue to meet its "responsibilities for humanitarian aid and reconstruction". Japan has pledged $5 billion in aid. 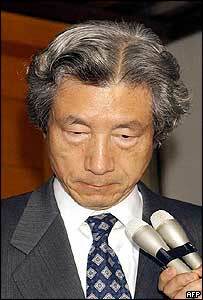 "Japan must not give in to terrorism," Mr Koizumi told reporters. The attack raises new questions over Japan's troubled plans to send troops to Iraq. Even before Saturday's attack public opinion was strongly opposed to any deployment of troops. Japan's constitution bans its forces from operating in combat areas overseas and no Japanese military personnel have been killed in action since the Second World War. An advanced fact-finding team is in southern Iraq to assess whether the conditions there are stable enough for the Japanese self-defence force to carry out its mainly humanitarian mission. The government had hoped the first troops could be deployed within the next few weeks but the BBC's Tokyo correspondent says that this timetable may no longer be realistic.